We will wakeup and leave the hotel by 8am, heading by foot for JR Sapporo station’s JR information desk located at the station’s west exit. 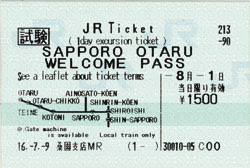 We should reach there by 8.30am, just in time for the information desk’s opening at 8.30am and enquire on the purchase of the JR Sapporo-Otaru Welcome Pass(below) which we plan to get for our planned trip to Otaru the next day. This 1 day train pass allows unlimited rides on JR Hokkaido trains between Sapporo and Otaru and on all subway lines in Sapporo for 1 day without additional charges. The cost is ¥1500(SGD$19.50) per pass. This pass is available to tourists only. 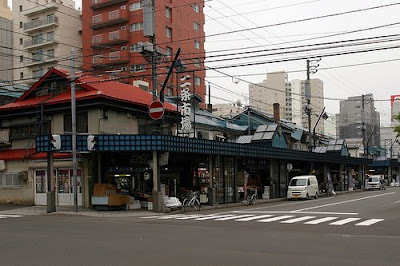 After that, we will take a nice walk, about 1.7km to the next subway station- Odori subway station where a 5minutes walk eastwards will bring us to Sapporo’s main market – Nijo market (below) is located nearby. Nijo Market is a public market in central Sapporo, where locals and tourists shop for fresh local produce and seafood such as crabs, salmon eggs, sea urchin and various fresh and prepared fish. 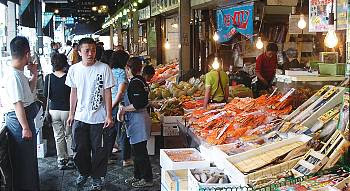 The market(above) is located near the Tanuki koji undercover shopping street and is arranged into crowded market alleys. 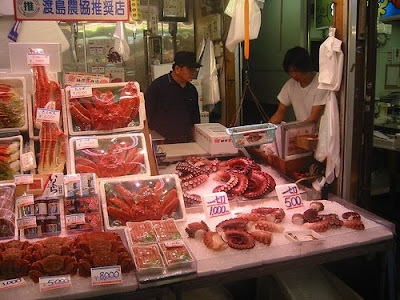 There are a bit over 50 different vendors in the market selling anything from fresh fish and crabs to sea urchins. We plan to have a fresh seafood breakfast there at one of the small eateries found in the market. 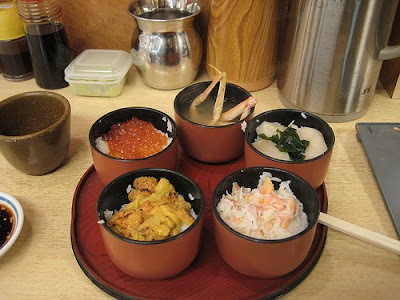 The standard item is the uni ikura donburi ( sea urchin and salmon eggs on rice ). The Nijo Market is open from around 7am to around 6pm on all days of the week, with individual shops maintaining their own opening hours and closing days. The market is a good place to have a vive, watching the locals and many chefs buying their seafood. Definitely a good place to take much photography. After this, we will head back to Odori subway station to shop at the Sapporo Underground Shopping Mall(Sapporo Chikagai) which is a shopping mall with 140 shops ranging from boutiques to variety stores to restaurants. The mall is divided by a concourse of Odori Station into two different styles of streets comprising of Pole Town and Aurora Town. These two underground shopping malls form an inverted “L”. The vertical line is Pole Town, which stretches 400 m north-south from Odori Subway Station to Susukino Subway Station on the Nanboku Subway Line; the horizontal line is Aurora Town, which stretches 312 m east-west from Odori Subway Station to Sapporo TV Tower. Both sides of these pedestrian corridors are lined with shops selling clothes and commodities, and there are restaurants, cafés and souvenir shops. The mall is directly linked not only to the subway stations but also to department stores, fashion boutique buildings and banks. This is especially good during winter where shoppers don’t have to worry about the weather. The underground malls provide good access to other department stores and other buildings. The Sapporo Transportation Information Center is at the intersection of the two malls for those who want to know more about Sapporo’s subway lines etc. 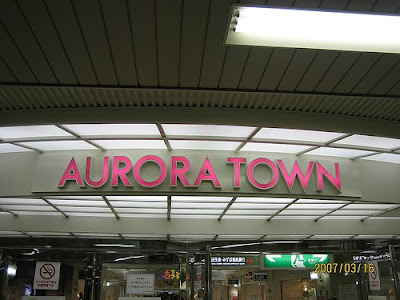 Aurora Town stretches 312m from Odori Station all the way to the TV tower in the east. The name of the mall was derived to invoke the image of a promenade filled with light and colours. Pole Town extends 400m from Odori Station south all the way to Susukino Station, linking two subway stations and creating an active and bustling town with a lively and relaxed atmosphere. Both ends of Pole Town are directly linked to department stores. One can also take the exits located along the sides of the town for various fashion boutique buildings and Tanuki-Koji, a kilometer-long shopping arcade with boutiques and stores. The Gallery Stella, decorated with stained glass works, and the Pole Plaza, located under Tanuki-Koji, are always crowded, mainly with young people who pass on the latest trends in youth culture from the town.The name of Pole Town is derived from a polestar. This should be enough to last us until lunch time. The shops there are open from 10am to 8pm. We will also visit the Mitsukoshi Sapporo departmental store, located a short walk from the Odori subway station where we are at. It sells a wide range of products such as food, clothing and gifts. 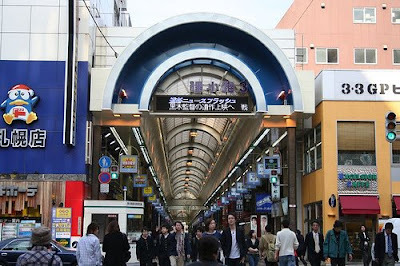 By the time we finish with shopping there,it would probably be close to 1pm where we will take a subway from Odori subway station to the next stop – Susukino subway station. From there we will fill our hungry stomach with some food. First stop would be a visit to the Susukino Ramen Alley(above). We’ve been told that you should not look for a place with that name because officially that name doesn’t exist. It’s actual name is Ramen Yokocho. It is located at intersection between South 5-jo and West 3-chome, Chuo-Ku. 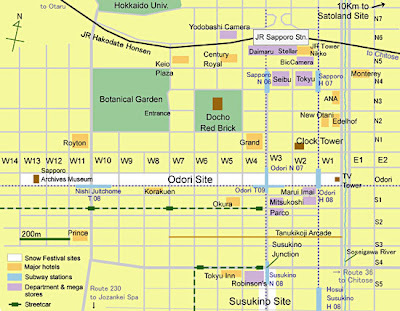 It is a 3 minute walk from Susukino subway station so using the subway as a point of reference would be a good start. The stalls there open from 11am to 3am daily. Ramen shops line both sides of this alley and it’s been said that every stall there has it’s own closely guarded recipe for it’s soup stock. There are 3 types of soup stocks that you can order for your Sapporo ramen (miso, soy, salt) and various toppings (scallops, corn, butter). We plan to share one bowl of ramen, miso with scallops(below) to try. By sharing this way, we can eat more of other stuff. 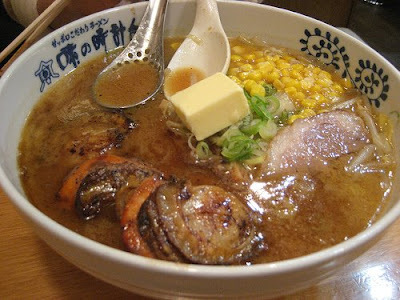 From what we've researched about the ramen stalls there, basically, there are two styles of ramen-ya, the diner style and the boutique style. Diner stryle ramen-ya tend to have plastic or formica tables, metal diner-stools, or folding chairs. They are brightly lit, and marginally decorated. These places are often quite old. Diner-style ramen-ya, I am told,tend to be cheap, around 400 to 600 yen, and have fairly small menus. Boutique style ramen-ya are newer and nicer. They have a theme for their decor – natural wood seems to be popular there plus cozy lighting. 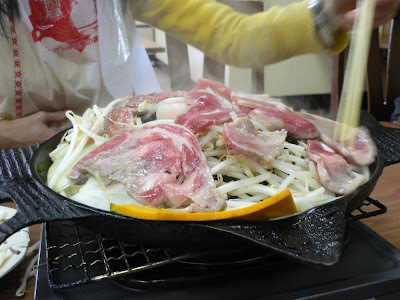 They often have a variety of menu options, prices in the 700 to 1200 yen range. According to Ramen experts, a key point to remember is that the quality of the soup has nothing to do with the price of the ramen. Soup is very, very cheap to make in large quantities, and its quality is entirely dependent upon the skill of its maker. The same can be said for the noodles. Many ramen-ya have a ticket vending machine near the front door. To order, buy a ticket, and then hand it to your server once you sit down. The buttons are always in Japanese. Generally, the upper rows are the different kinds of ramen for sale. The rows (across) are often sorted by soup-type, and the columns (down) by topping-type. Simpler, cheaper items are on the left, and the more elaborate and expensive ones are on the right. Anything that costs less than 400 yen will be either an additional topping, a side dish, or a drink. 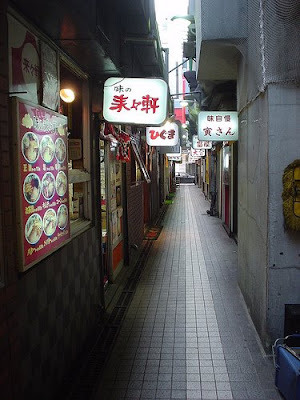 From Ramen Alley, we will walk over to Tanuki Koji South 3 West 2 just off east of the Susukino subway station. There is a recommended Japanese pub called Aburiya there that is said to sell real Hokkaido food, not the touristy corn and potatoes. Aburiya serves sushi, salmon, sea urchin and vegetables from around the prefecture, cooked in simple, honest Japanese style. “Aburiya” means “the grilling place,” and we read that it is a must to try the charbroiled maitake-beikon-maki, (mushrooms wrapped with bacon). For broiled fish, we will ask for the daily catch (honjitsu-no-yakizakana). The yakitori skewers of chicken (torikushi) and pork (butakushi) are said to be wonderful, and the salad plates and grilled eggplant (yakinasu) will give us a chance to dig into some healthy vegetables. Their sashimi plates (sashimi moriawase) are great, too. It’s in the Tanuki Koji shopping arcade and can be located by their green awning and the double flight of descending steps. From reviews we read, the menu there is challenging and the brisk, backslapping pace can make ordering a bit daunting, but the food and atmosphere make it worth the effort. Meals with beer is between 3,000 to 5,000 yen per person. 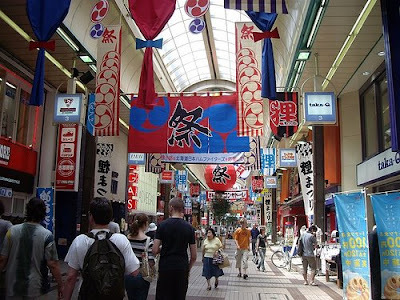 As we exit from Aburiya after a hearty lunch, we find ourselves within the Tanuki Koji shopping arcade where Aburiya is located. The largest shopping mall in Sapporo, it extends to about 1.5km. Tanuki Koji has a history that stretches back 123 years. There are more than 200 stores there offering a variety of goods ranging from clothes and footwear to electrical items and furniture. 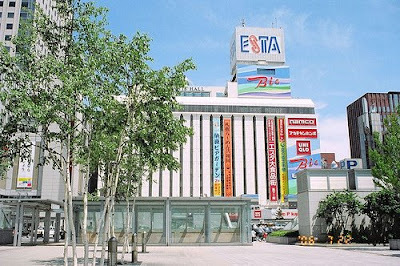 This mall is known for it’s offering of both traditional and modern Japanese merchandise from kimonos, tea or incense to modern stores specializing in computers and software or state-of-the-art electronics or digital cameras, clothing, accessories, cosmetics and shoes. There are also game centers, restaurants and coffee shops within. Things here are said to be much cheaper than those from other similar shopping areas. A hat can be gotten here below 100 yen, much cheaper than the 100 yen shops nearby. A wide variety of dishes including Japanese, Western and Chinese cuisine are available at the restaurant mall on the seventh and eighth floors. We may try out some leg massage there to soothe our aching leg muscles from all the shopping! 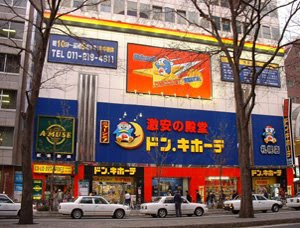 From there, we will move on to Donki Kingdom store, a 3 minute walk from the Susukino subway stationn. It is a famous chain of stores in Japan that sells cheap foodstuffs, toiletries and other misc. items that are useful. The biggest plus is that they are open till very late! Some are open 24 hours! They can sell shampoo, cushions, MD walkmans, watches and curry packets. We will shop till 6 plus and probably the cold and constant walking would have made us hungry for dinner. For dinner, I will be bringing Gayle for shabu shabu at Shabu-Zen, an all you can eat eatery located within the Robinson’s departmental store on the 7th floor. Shabu-shabu is the sound of thinly sliced beef and vegetables being swished through simmering water and the name for that style of cooking. We will also try lamb too. There are no English menu here, but Shabu-zen has four all-you-can-eat options to make ordering easy. For your group, choose from shabu-shabu, sukiyaki, suki-shabu (half sukiyaki, half shabu-shabu) and yaki-shabu (half Korean barbecue and half shabu-shabu). I recommend the half-and-half deals for their variety. These come with vegetables. It’s all-you-can-eat, so keep ordering trays of meat or vegetables until you’ve had your fill. The dinners are priced according to the quality of beef, with the basic grade costing 2,000 yen per diner. Drinks will incur an extra charge. After this nice hot dinner, we will be invigorated to walk along the Susukino night district(above) , which is a must do in Sapporo. 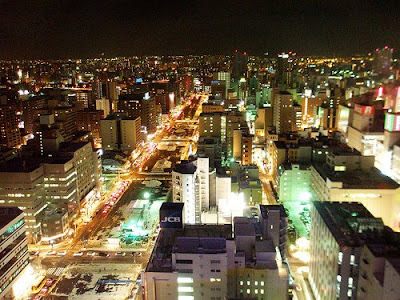 There are about 4500 businesses ranging from bars and restaurants to soaplands and brothels along the Susukino district and they are the reason why Sapporo has one of the best nightlife districts in Japan. There is the usual obligatory red light district there but for most parts, it is a good place to have eat, drink and have fun. Those into karaoke and pubbing will definitely find the place something up their alley. From what we read, there are many nightclubs and discos - the most famous being the decadent King Xmhu, but there are also many bars for drinking, ranging from somewhat traditional yakitori or izakaya style establishments to "gaijin" bars such as Rad Brothers, Jersey Bar, Locotonte and Salsita. There is even a gaijin(foreigners) bar called Gaijin Bar, though it is described as a bit of a dump. There are quiet jazz clubs and noisy live houses, including somewhat odd places such as Voodoo Dance and 350 Bar, as well as interesting but pricey beer pubs like Mugishutei. Susukino is also a hot dating spot, known for being a fairly easy place to pick up a Japanese girlfriend or boyfriend, though the substance of such casual relationships are likely to be somewhat short term. However, we read that in spite of all these bars and nightspots, Susukino is still quite safe and well lit. Even ladies can drink here without having to worry about their safety. Apart from the usual range of karaoke and junk food outlets, there are many good restaurants & bars, as well as a large number of hotels ( We will be looking at the rent by the hour "love hotel" kind just out of curiousity). 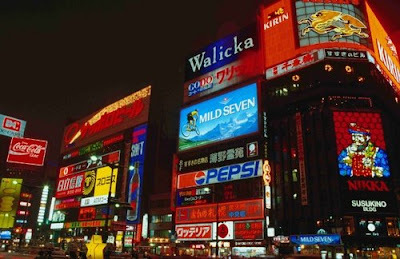 Susukino is a bustling nightlife district that gets more crowded with each passing hour of the evening. Recently, hot spring hotels with saunas have become popular there. After a whole day of walking and shopping, we will take the train from Susukino subway station back to Sapporo subway station and then walk back to our hotel for a good rest and look through our shopping conquests. Waking up at 6.30am, we will wash up, do some final packing before we head down for our complimentary breakfast at our hotel - Hotel Yumoto Noboribetsu. We will then check out of the hotel after breakfast which should be about 8.30am by then to make our way to Noboribetsu Onsen Bus Terminal. We have two ways to reach Sapporo, either by bus or by train. If we take the bus, we can leave directly from Noboribetsu Onsen Bus Terminal but if we take the train, we will have to take the 15 minutes feeder bus to the JR Noboribetsu Train station. By train, the journey from Noboribetsu will take 1 hour and 10 minutes. By bus, it will take 2hours and 30 minutes. Bus is definitely much cheaper at ¥1,900 (SGD$16) for single trip while the single train ticket costs ¥3,850 ($32) for an unreserved seat. So which we take depends on timing , schedule and our budget at that point. Most likely ,we may take the JR Limited Express train to Sapporo which departs at 9.30am since it arrives at Sapporo by 10.40am which will allow us to gain some extra time. On arrival at Sapporo, we will head for the tourist information centre to get maps and information. It is located within the North 6 West 4 - West Concourse(Food & Sightseeing Hall) of the JR Sapporo Train Station building. It is opened from 8.30am – 8.00pm daily. Staff are able to converse in English and Mandarin which will be of great help. We will also check with them on information for the purchase of tickets for the JR Rapid Airport Express from Sapporo to New Chitose airport which we will need when we leave Sapporo for Tokyo in 3 days time. 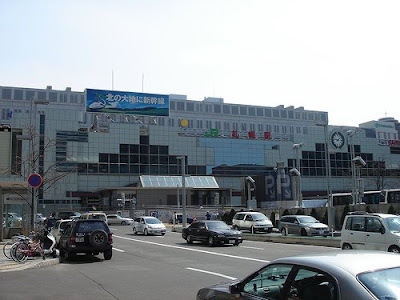 After getting what we need from the tourist information centre, we will take a walk around JR Sapporo train Station shopping mall which comprises of main department stores like Stellar and Daimaru. As we may be too early to check into out hotel, we may grab a bite and have a short rest at Toppii, a traditional sushi bar that is located on the 10th floor of the shopping mall(access by elevator near Bic camera shop). The sushi plates are colour coded in price bands and are circled around on a conveyor belt. The complimentary hot green tea served here would be most welcomed by us in this winter. Good thing about Toppi is that they have menus in English which makes ordering and dish identification easier. Each plate cost an average ¥110(SGD$1.45). This place is recommended for it’s mouth-watering sushi. It is opened from 10am to 11pm and is crowded at peak hours. We will also check out Sky J, a recommended restaurant located on the 35th storey of JR Sapporo Nikko Hotel, which is located in the same building complex as JR Sapporo station. We will make a reservation there as I heard the view and dinner buffet there is worth a splurge. We will then walk out onto the street North 4 in the direction where North 4 intersects with West 7 street where our hotel – Keio Plaza is located. Sapporo streets are designed in an interlocking grid layout which makes for easy map reading. We chose the Keio Plaza hotel as it is located in the heart of Sapporo where the main shopping and entertainment belt is within close vicinity. 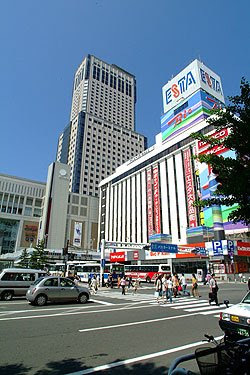 It is also within walking distance from JR Sapporo railway station and tourist attractions. Sapporo has the particularity that addresses are described as cardinal point from the official city center (near the TV Tower). Odori-koen Park (大通り公園) divides the city in "North" and "South", while the Sousei-kawa Canal (創成川) divides it in "East" and "West". The major avenues further divide each block by number (North 1, North 2, North 3, etc.). Each block can be found by its geographic location on the grid (eg. 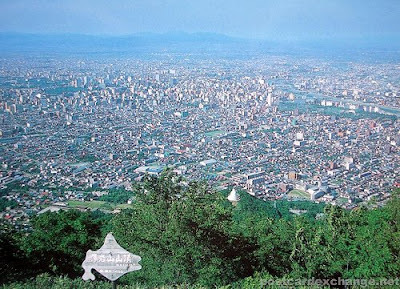 North 3, West 5), making Sapporo one of the easiest city in Japan to navigate ( See below). We will see if we can do a check in and if not, we will ask to leave our bags in storage with the hotel and maybe explore the Botanic gardens(below) diagonally opposite our hotel to take some scenic shots. 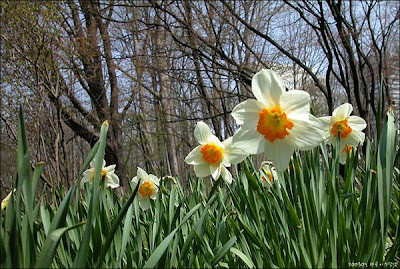 This 13-hectare (32-acre) park with its entrance at North 3 West 8 contains some virgin forest and more than 4,000 varieties of plants gathered from all over Hokkaido and arranged in marshland, herb, alpine, and other gardens. Of greater interest, perhaps, is the section devoted to plants used by the Ainu,one of Japan’s tribal group whose extensive knowledge of plants includes not only edible ones but also those with medicinal use and other properties, including organic poison used for arrows to kill bears and other game.We are told that it is a popular spot for an afternoon picnic in the summer, due to it’s large expanse of trees and grassy lawns. 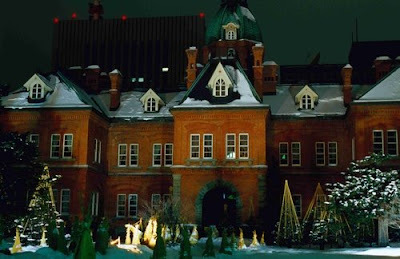 Other attractions within the park includes Japan's oldest natural science museum, founded in 1882 to document the wildlife of Hokkaido and housed in a turn-of-the-20th-century, Western-style building. Admission to the park is ¥110 (SGD$1.05) per person. After looking at the park, we will then head back to the hotel and check in at the allowed time. We will probably take a short rest, probably till 3pm before heading out to take a walk towards the vicinity of the JR Sapporo train station where we first arrived to visit the major departmental stores there such as Daimaru, Stellar, Seibu and Tokyu. Along the way to the shopping at JR Sapporo station, we will pass a Victorian era building along the way known as the Docho Red Brick building(above), previously used as an administration building but which is now used as the Hokkaido archives office which showcases Hokkaido’s colonial past and it’s fairy tale like setting in winter is good for photo taking. 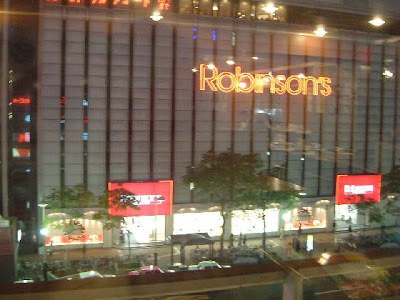 At JR Sapporo station shopping mall district which comprises of shopping complexes and underground malls plus rows of discount shops, shopaholics will have a good time there. Most of the shopping complexes there are connected via the underground train station pedestrian connector. First stop would be Sapporo Tokyu. Of interest is the sale of Japanese foodstuff and snacks at the basement. Next stop would be at Sapporo Seibu which is comprised of 2 buildings: a main red-brick building with a lot of clothing sections, and its unique annex loft aiming at younger generation which has rows of boutiques and shops of different variety. 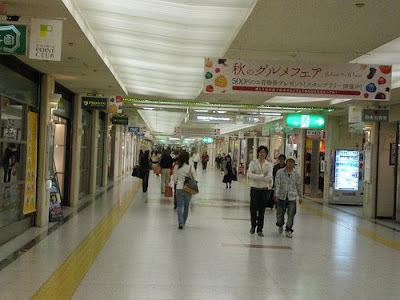 There are also underground shopping belts such as Apia and Paseo. Another one is Esta(above) which features various kinds of foodstuffs and delicatessens on the basement flour. 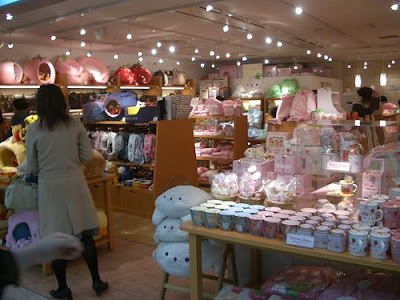 On the upper floor, there are different kinds of shops and a big area dedicated to electrical appliances. Another complex is Bic Camera which is located at the south side of Sapporo station, accessible via JR Sapporo Station. There is a food hall here besides the general range of clothing, accessories, general items and restaurants on the upper floors. Of interest here are the 100 yen shops, supposedly better than Daiso at the basement floors. For those interested in Japanese anime books, you can source them at three book stores in the area – Sanseido located on the 8th floor of the Daimaru Departmental Store which has a cafe where you can bring new books inside it’s cafe to browse. Now that’s what we call customer service. There is also Asahiya on the 5th floor of Stellar Place East Shopping mall and Kinokuniya on the West side of Daimaru which also has a cafe on the 2nd floor. 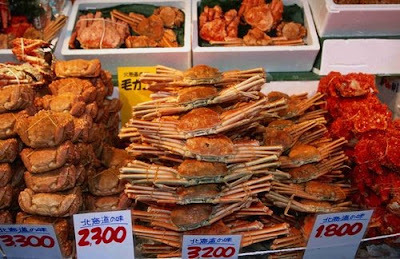 For food, we may go to Sato Suisan located South side of Sapporo station which specializes in many kinds of sea food such as crabs(below) and local delicacies. We will shop till the shops close and thenl head for dinner. Most shops in Sapporo usually open on a daily basis, although the smaller shops may not open on Sundays and open from 09:00 and 17:00 during the rest of the week. The largest department stores often open from 10:00 until as late as 19:00, while supermarkets generally open seven days a week, from 09:00 or 10:00 until 17:00. Some department stores do choose to close for one of two days each Monday. I plan to bring Gayle to Sky J restaurant, for which we made reservation earlier that morning (tel:011-251-6377) for a romantic dinner at the top of Sapporo’s tallest building – The JR Sapporo Nikko Tower on the 35th floor. The food is pan-Asian buffet style, plus Western and some Japanese. From here, we will be able to see the evening skyline from north to Ishikari Bay and south and west to the mountains. The buffet is less crowded after 1PM. I’m told that the staff can understand basic limited English but they make up for it with their friendly service to customers, especially tourists. For an extra 500 yen, the buffet includes all the wine you can drink. Dishes are marked with signs in Japanese and English. After a good dinner and some good scenic shots, we will take a nice winter walk back to our hotel to have a good rest, consolidate our shopping buys and plan for the next day activities. Well, the ride was for the experience but we don't think we are going for a second time unless there is another free offer. There is the Singapore skyline which provides many good photo opportunities. Three things to note though , car park is exorbitant at $7 per entry ( You can park at Ritz Carlton and take a walk ) , choose your cabin( we waited for the next cabin as there was a large group of aunties and uncles who were very noisy chatting away). We elected to let them go first and we took the next cabin which comprised of a few tourists and young couples who like us, wanted to enjoy a peaceful ride. It would also be helpful if you can bring a camera stand to take couple shots or groups shots better. Otherwise, just ask your fellow passengers to help you take which is what we did. There are a few eateries there though we think that there are many other better places nearby to eat unless you want to make your $7 worth of parking and linger there longer. Of interest is the aicraft simulator centre which you can try flying a simulator based commercial jet for $155 for 30 minutes flight experience. We booked a Retreat 'Signature embrace' couple spa package at the Retreat Spa and Thalasso Centre at Changi Village Hotel which comprised of a 3hr spa session in our own spa suite plus 2 nights stay at the hotel. The service and quality of experience was very good,classy, very private , the masseuses were patient, professional and gave a very good massage. You do get quality for the money you pay. We paid $1082 inclusive of GST for everything. On arrival, we found that they were awaiting us because as we entered the reception, they knew who we were and led us to a lounge specially reserved for the two of us. The two masseuses attened to us by informing us about the program for the spa session, took down our health requirements and asked about possible allergies or sensitivities. We also had a blood pressure test. We were then served ginger tea and invited to relax in the lounge while they got ready the couple spa suite for us and also helped take care of the necessary administration and billing for the check in to our hotel room on our behalf . It was a relaxing start and Gayle and me spend some time there chatting and having tea. (Above)On the way to the spa suite, this area is used for ROM solemnization ceremony. Quite good views and scenic for photo taking. The masseuses soon arrived telling us that our hotel room was ready for immediate check in anytime we were ready after the spa session. They then brought us up to the spa suite located on Level 9, which was the rooftop deck of the hotel. Access by a private spiral stairwell and wow, were we impressed with the coziness and privacy of the couple spa suite when the door to the suite was opened for us. The masseuses briefed us on the amenities of the suite and informed us that we had a free and easy time of 50 minutes to shower and relax in the jacuzzi. There was a pot of hot jasmine tea and also a fruitty chocolate fondue set for us too. It was a first for us,having a shower on the rooftop in the open, very liberating. Strategically placed palms and other flora helped provide a natural privacy screen. After the refreshing shower, we had a really nice quiet time in the jacuzzi, the water jets helping to massage and stimulate our back and shoulder areas. The view was wonderful, looking out into changi beach and the sea. We spent the time chatting,admiring the view(below),catching the planes coming in for touch down at Changi airport. It was really a refreshing top of the world feeling. We had another shower and went into the airconditioned suite to enjoy our tea and chocolate fondue as we waited for our masseuses. The chocolate fondue provided sweet accompaniment to the refreshing jaccuzi we had.A discreet knock on the door signalled the arrival of our masseuses who asked if we were ready for our spa session. They led us to our seats and started with what they called the Retreat welcome which comprised of a mineral salt foot bath that continued into a foot massage and cleaning of our feet. It was really a shiok feeling because our job requires us to stand on our feet for long hours daily and well all we can say is that our feet really felt wonderful. The service was very warm and personalized as they lifted our foot onto their thighs and wiped , massaged our feet. It was a strange but warm and nice feeling though as we were initially not quite used to such personalized service. We were then invited to lie down on our respective spa beds for a aromatic sea salt glow body scrub to remove our dead skin cells and provide a rejuvenation of our skin. the whole body scrub was very soothing and massaging. They told us to be wary of the cold of the scrub that they put on us. It was cold initially but as they rub it on, it felt cooling. Both of us felt that the body scrub was really good because for the first time after the session, my skin was like shiny and glowing and there was no oily feeling. My usually dried skin on my arms and legs had all but gone. Our skin was really smooth and soft to the touch. We then had a shower to wash away the salts before proceeding on to our Swedish whole body massage. Gayle liked the shoulder and neck part while i preferred the leg and foot part of the massage. After this experience,I think i am addicted to foot massage already. The Swedish massage was good as the pressure was just right.